It is the beginning of a new year and the resolutions are being tossed about...in a somewhat hushed tone in case I don't accomplish them. But I forge on and say it aloud: I'm not buying anything this month. Silence. Did I really say that out loud? I did. Now I really have to do it. Gulp. My resolution is to cut out any extraneous spending this month. Except food and grocery items. We need to eat, right? And unlike the peak of summer, there is no chance of living off the land right now. The shockingly-perky thyme, meagre rosemary plant, sprouting garlic, and rather sad-looking kale are all currently covered in snow. But even then, I am wondering...could we do like my friend who lived in the Yukon and only grocery shop once a month? And what counts as essential items? Cleaning products? Contact solution? (Luckily I found a hidden bottle!) What about birthday gifts? Kid bribes? Too many things to consider. It may just be more about reducing consumption. Try and use what we have. This means cleaning out cupboards, not hitting the store every time I think I need something, making do. It might mean I need to beg, borrow, or google some random DIY stuff. But that stuff never works anyways, so I will make do. 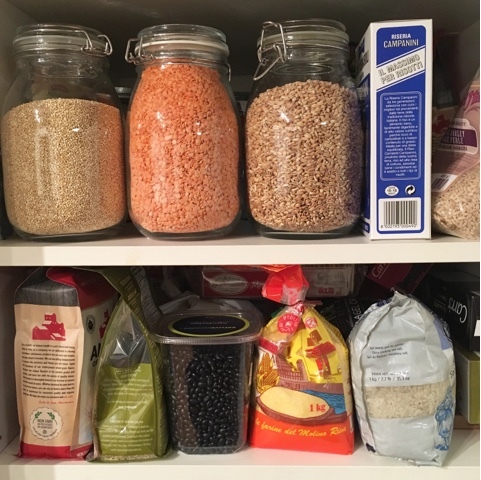 In addition to cutting spending, I will be hitting the pantry hard this month: using up the random varieties of rice, lentils, and beans that have sat forlorn on the back shelf. Risotto rice, wild rice, brown short-grain rice, white basmati rice, sushi rice...the list goes on. Seriously, how do I have this many varieties?!? And trying to get to the bottom of that freezer. I think it may need defrosting? The first recipe of the year uses the split peas that were sitting in the pantry. 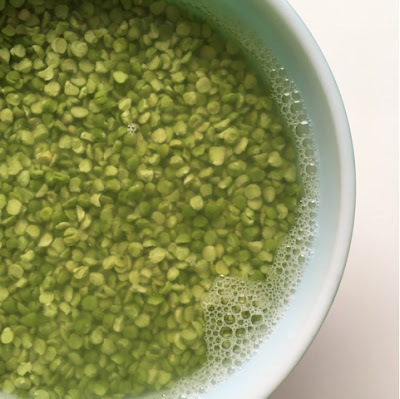 And this soup is pretty simple to make, nourishing, and well, it's cheap. I have been making this since my basement-living university days, and pretty much have it memorized, so it's a keeper. Easily customizable if you have some carnivores in the house: add bits of chopped ham or bacon at the end. Soak the split peas for a few hours if you remember. If you forget, like I do, just rinse them a few times and then pour hot water over them while prepping the soup, then drain and proceed. 1. Heat oil in large soup pot over medium-high heat. 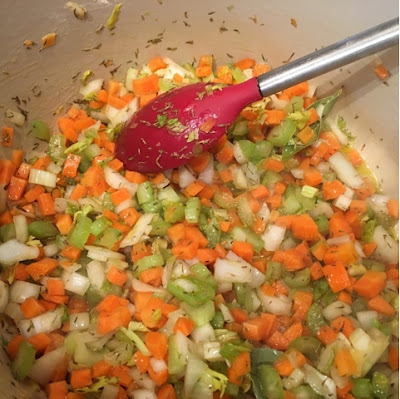 Add onion, carrot and celery and stir occasionally until partially cooked, about 5 minutes. Add bay leaf and thyme and stir again. 2. Add rinsed split peas and broth or water. Bring to a boil, stirring occasionally. Turn down the heat to low and cook for at least one hour, again, stirring occasionally so it doesn't burn. Season to taste. Serve immediately.